If you like chicken but are ready for a change from all your same-ole-same-ole dishes, try this easy stir-fry tonight—you may very well even have all the ingredients in your freezer, fridge, and cupboards. This Asian-Mexican dish is simple to make, delicious, and will make great leftovers for tomorrow's lunch. 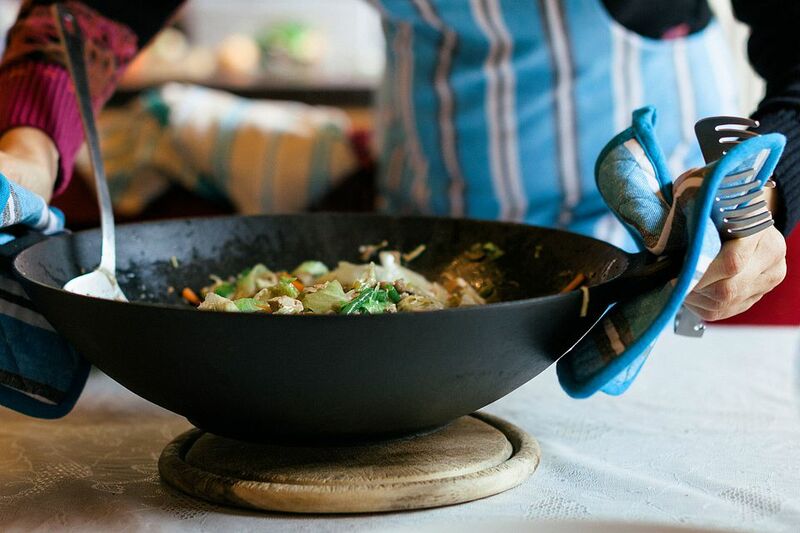 Heat the lard or oil in a large wok or skillet over medium heat. Add the strips of chicken and stir-fry for 10 minutes. Add the onion and garlic and cook together for another 3 or 4 minutes or until chicken is cooked through. Reduce heat to low. Add the rice, beans, chili powder, and cumin. Continue to stir-fry for 3 or 4 minutes, until heated through. Add soy sauce or salt to taste. Serve immediately. Any leftovers will keep nicely in the fridge; reheat in skillet or microwave for a delicious “re-run” of flavors. Chicken breasts are much easier to slice with a knife if they are semi-frozen, so stick them in the freezer for an hour before using and you’ll have to work a little less hard. If there’s no time to freeze your chicken, cut it into strips with kitchen scissors instead of a knife. Add some Mexican vegetables to the mix. Try some diced summer squash (zucchini or similar) or some thinly sliced chayote; add at the same time as the onion and garlic. Don’t forget a little seeded and diced jalapeño or serrano pepper, too, if you like heat. Include an Asian-style vegetable or two, if you prefer: fresh, tender snow peas or bean sprouts work well, or how about some (drained) canned bamboo shoots? Trade some or all of the rice for cooked hominy. If using canned hominy, drain it thoroughly first. Include some diced or thinly sliced fresh jicama in your stir-fry to add fiber, fun, and a crunchy element to the mix. Chinese-style restaurants in Mexico often use jicama in their dishes since water chestnuts are exotic and difficult to come by there. When serving, sprinkle some toasted sesame seeds or a mixture of finely diced raw onion and chopped cilantro over the top of each portion.